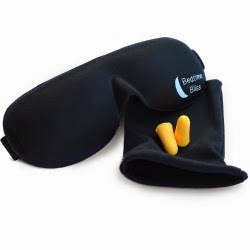 Contoured & Comfortable Sleep Mask, Ear Plugs & Carry Case from Natural Revolution, Ltd. This eye mask will help you sleep better at night by blocking out the light that can often keep you awake. I did not really care for this particular sleep mask. It did not fully block out the light under my eyes as other sleep masks do. Although comfortable to wear it just didnt really do the full job I expected, and the ear plugs are the cheap foamy ones that can be purchased at any store. I do like that it comes with a carry case which comes in handy when travelling and makes it easier to find the ear plugs and mask when needed. This looks like it would be just right for me. I am always looking for the next best thing! Super - glad I could help you find something useful - that is why I post reviews! Thanks for stopping by and leaving a comment - I love getting to know what my readers like!